(The Sports Xchange) - The Golden State Warriors' quest to become a big part of NBA history remains alive -- barely. Golden State, seeking to become the first team in league history to win 73 games during the regular season, was nearly denied the opportunity by the slumping, injury- depleted Memphis Grizzlies. 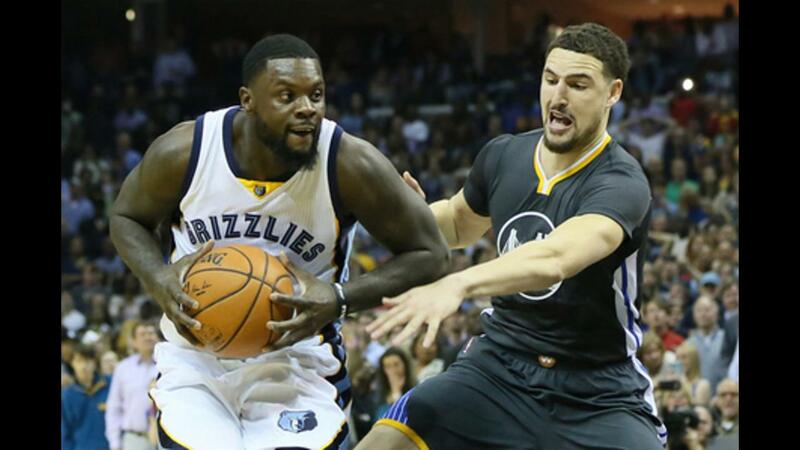 Memphis, which had lost 11 of its past 14, led most of the final quarter before falling to the Warriors 100-99 on Saturday. Golden State, which rested starting center Andrew Bogut, had difficulty against a team it had beaten soundly in two earlier games -- including a 50-point win at home. Steph Curry and Klay Thompson struggled from long range going a combined 5 for 24, but Draymond Green rescued the Warriors with 23 points, including the game-winning tip-in with a minute to go. He also had 11 rebounds. "I think the whole game we weren't playing with any intensity," Green said. "We were just out there thinking we were supposed to win and they were taking advantage of that. We got down 10 (points) and the crowd was going crazy and we finally started playing with that intensity." Golden State is 71-9 with games remaining at San Antonio on Sunday and at home against the Grizzlies on Wednesday. The Warriors are attempting to surpass the 1995-96 Michael Jordan-led Chicago Bulls, who finished 72-10. "I shouldn't say this, but I don't care that much (about reaching 73 wins)," Golden State coach Steve Kerr said. "I know the players do. I just want to be fresh and ready for the playoffs." Thompson added 20 points and Curry finished with 17, although he went 3 for 14 from beyond the arc. "The (73) wins are in the back of our minds because it would be such a great accomplishment," Thompson said. "Whether we get it or not, we're not going to hang our heads because it's been such a great season." Matt Barnes led the Grizzlies with 24 points and 15 rebounds, and Vince Carter scored 15. Memphis had a chance to win in the final eight seconds, but Lance Stephenson missed two shots -- one from close range and a desperation 16-foot fadeaway at the buzzer. "I think we just competed," Kerr said. "We held them to 38 percent shooting, so the defense was good. And that's a physical team. They get a lot of offensive boards and a lot of stuff in the paint." Curry didn't make his first 3-pointer until 7:36 to go in the third quarter. He missed his first five attempts, but finally connected to extend his consecutive game streak of at least one 3-pointer to 150. Memphis erased a 53-50 halftime deficit with a strong third quarter and led 74-65 late in the period after an 11-0 run capped by reserve point guard Xavier Munford's 3-pointer. "Tremendous effort from our guys, great job battling," Grizzlies coach Dave Joerger said. "I thought we saw some great performances from our guys, but at the end of the day we just didn't have enough offense." Memphis entered the fourth with a 78-70 lead and went ahead by 10 on a driving dunk by Matt Barnes. They led 90-80 midway through the quarter on a reverse layup by Barnes. The Warriors chipped away at the lead on 3-pointers by Curry and Andre Iguodala and grabbed their first lead of the quarter 98-97 on a 3-pointer by Harrison Barnes with 1:40 to go. After the Grizzlies regained the lead 99-98 on two free throws by Matt Barnes, Green scored on a tip-in with one minute to go for a 100-99 advantage. The tip-in was originally ruled offensive basket interference, but overruled upon a review.